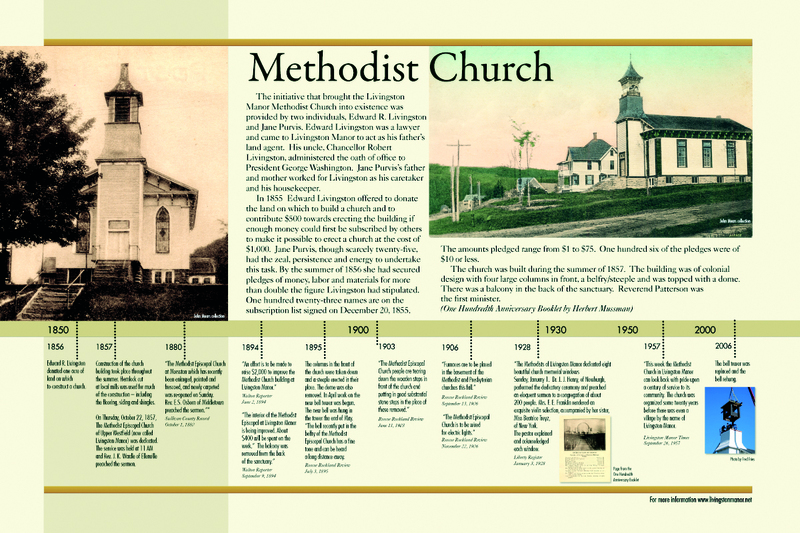 The oldest known and documented structure within the village, the Methodist Episcopal Church, was erected in 1857. Dr. Edward Livingston, the landed gentry upon whom the village takes its name, offered to donate and and contribute $500 for the erection of the building if community members subscribed to an equal amount. Through the efforts of 25-year-old Jane Purvis, the villagers enthusiastically responded by contributing twice that amount. 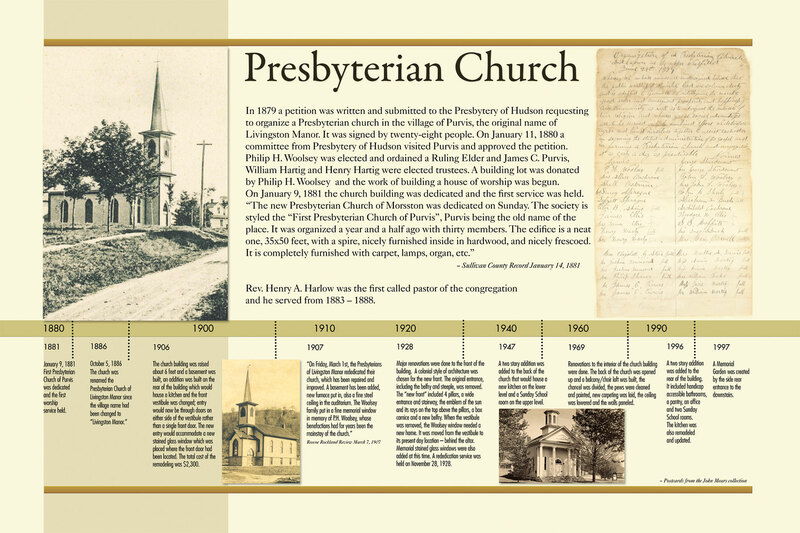 The grandson of a Presbyterian minister and major figure in the early development of the village of Livingston Manor, Philip Henry Woolsey donated the land for the construction of the First Presbyterian Church of Purvis, the community’s original name. A lumberman by trade, Woolsey easily succeeded in securing community support for the new structure, which was built in 1880. Following his family’s interest in regard to religious matters, Woolsey had long been a liberal supporter of the church and for several years occupied the local Presbyterian pulpit. The Siegel Building was built in 1890 by Alonzo Ostrum, the colorful village blacksmith, who conducted his blacksmithing shop here for over twenty years. Upon purchase of the building by Solomon and Benjamin Siegel in 1913, the old blacksmith shop was converted into a grocery store. 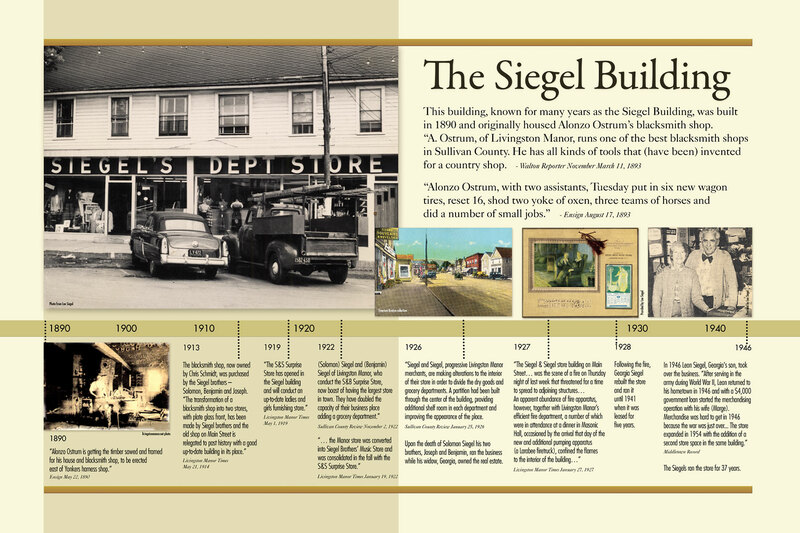 Numerous businesses have since taken-up residence in the building since the Siegel purchase, the longest of which was the Siegel Department Store, operated by Solomon’s son, Leon. 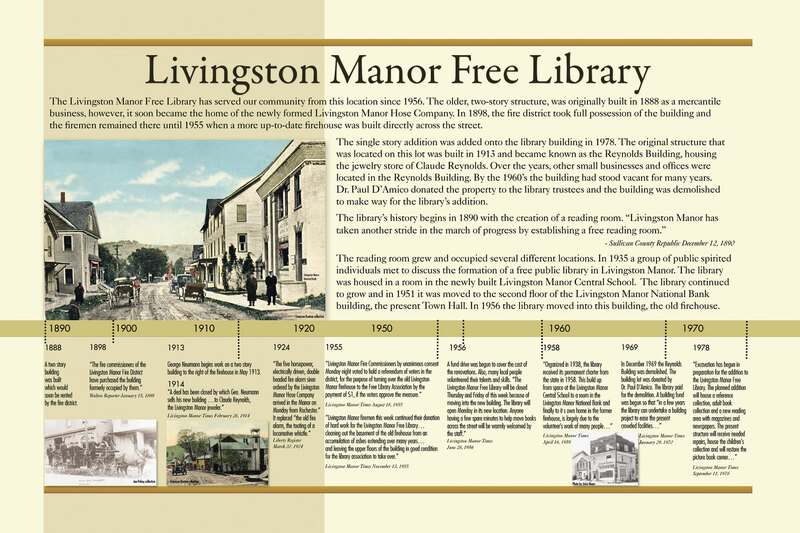 The two-story structure housing part of the Livingston Manor Free Library, was built in 1888 originally as a mercantile business, but soon was converted to house fire-fighting equipment for the Livingston Manor Hose Company. With the construction of a new firehouse across the street in 1955, the firemen voted to turn over the old building to the Free Library Association. Upon acquiring the Reynold’s building and lot next door in 1969, the LM Free Library demolished Reynold’s building and in 1978 erected the single story library addition. 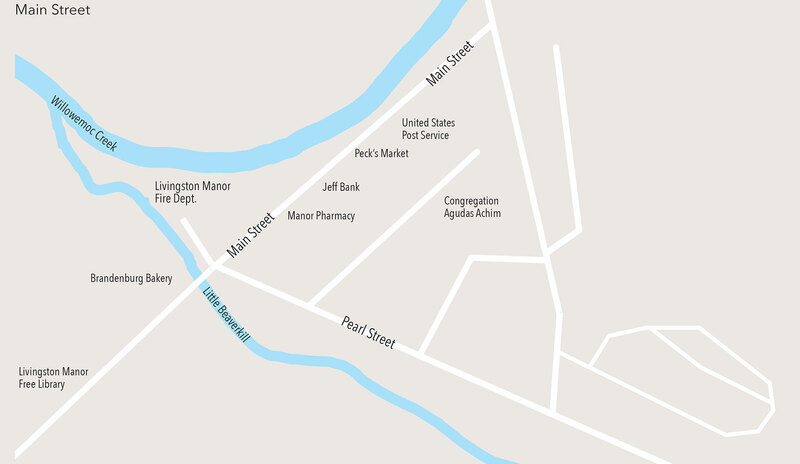 By the beginning of the twentieth century, Livingston Manor had become a flourishing community. 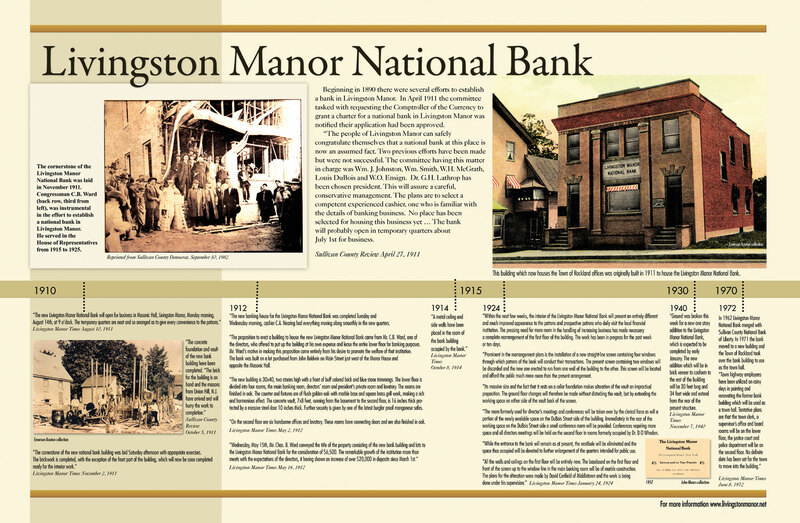 Having an important railroad freight yard for the New York, Ontario & Western Railway and local businesses thriving, a movement begun in 1908 culminated with the building and opening of the Livingston Manor National Bank in 1911. 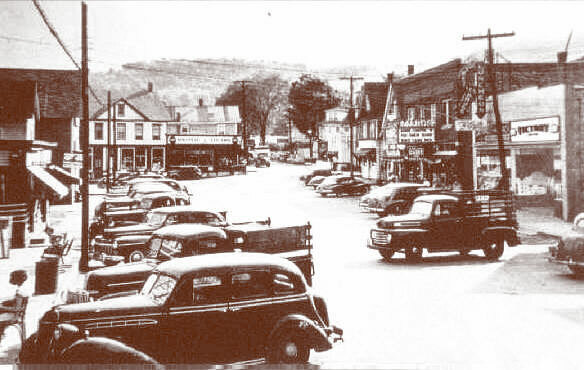 Later becoming known as the Sullivan County National Bank, the financial institution moved its new location in 1971. The building was then purchased by the Town of Rockland and by the end of 1972, all the town offices were moved into the former bank building. Historic Walking Tour map in progress. Looking across the Willowemoc Creek towards the Livingston Manor Central School you are looking at what was once called Sherwood Island Park. 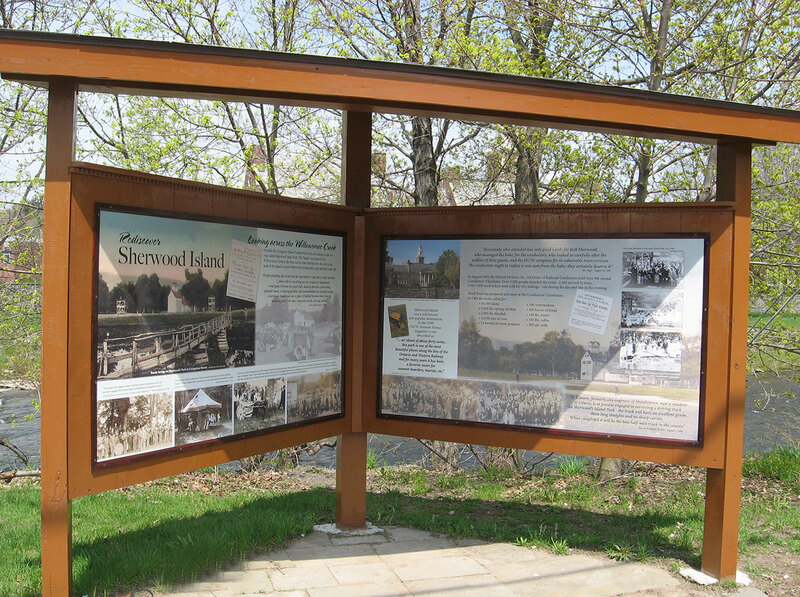 The “island” was formed by the Willowemoc Creek in the front and by water diverted from the creek to the back of the island to power Sherwood’s turning mill, a grist mill and a cider mill. People attending the events had the opportunity to take part in many activities. “...there will be everything you can imagine for amusement, a ball game between two good clubs, dancing afternoon and evening, splendid music, a dancing pavilion that accommodates two hundred couples, a merry-go-round and, say, a game of football between clubs from the northern part of the state composed entirely of young ladies...” - Liberty Register August 7, 1891 From the mid 1800’s through the early 1900’s Sherwood Island Park hosted many events. These included the O&W Conductors’ Clambakes, fairs sponsored by the Agricultural Society of the Town of Rockland, Fourth of July celebrations, amateur shows put on by local organizations, horse races, sporting events, concerts and dances. Other activities included tub races, running races, sack races, putting the shot, climbing a greased pole and trying your luck on gambling devices and nickel-in-the-slot machines. Round Top Abandoned woodland roads, developed long ago for the harvesting of lumber and bluestone, are part of the foot trail network that climbs to the peak of Roundtop. 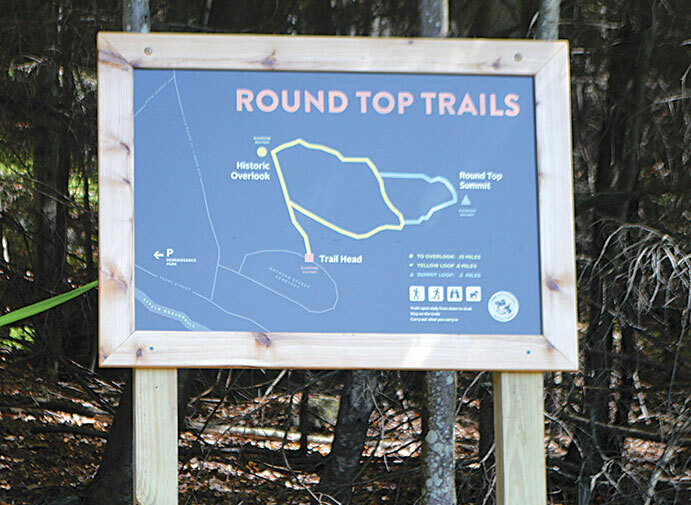 With views off its ledges that spanned across the Willowemoc Valley, Round Top had long inspired economic, impassioned and whimsical ventures since the earliest of Livingston Manor settlers.